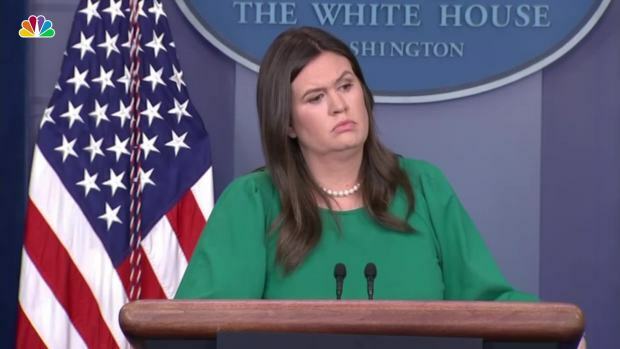 Trump said "nobody manipulated" a video distributed by White House press secretary Sarah Sanders that showed Acosta resisting an intern's attempt to take a microphone from him during a news conference on Friday. 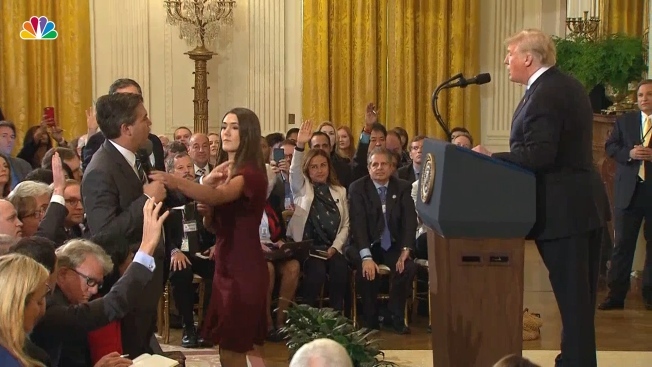 A video expert had told The Associated Press that the video appeared doctored to speed up Acosta's arm movement and make his gesture more threatening; the White House used that encounter to justify pulling Acosta's credentials. "It wasn't doctored," the president said. "They gave a close-up view. That's not doctoring." Abba Shapiro, an independent video producer hired by The Associated Press to compare the footage tweeted by Shapiro with the AP's coverage of the news conference, said the alteration made was "too precise to be an accident." Two late-night comics, Stephen Colbert and Jimmy Kimmel, both said on their shows Thursday that Sanders should be fired for her action. "The fact that the White House press secretary is promoting this doctored video is reprehensible, and grounds for dismissal," Colbert said. Trump also did not back off his administration's decision to suspend Acosta's press credential, which allows the CNN correspondent access to the White House grounds. "He's a very unprofessional guy. I don't think he's a smart person but he has a loud voice," Trump told reporters in a testy 20-plus-minute exchange before he left for Paris and a World War I commemoration ceremony. Trump said he hadn't made a decision when asked by a reporter how long Acosta would remain in the "penalty box." But he said there could be others. "When you're in the White House, this is a very sacred place to be," he said. "This is a very special place. You have to treat the White House with respect. You have to treat the presidency with respect." Olivier Knox, president of the White House Correspondents Association, said his organization's board met Thursday with Sanders and White House communications director Bill Shine for what it expected to be a series of conversations about Acosta's status. Despite losing his White House pass, and the ability to travel with Trump and the rest of the press corps on Air Force One, Acosta went to Paris to cover Trump's meeting with world leaders this weekend. He tweeted a photo of himself standing in front of the Eiffel Tower early Friday. Trump's latest attack on the media came in the wake of his free-wheeling and contentious news conference two days earlier, and followed demands by several journalists and organizations — including the American Society of News Editors, the Associated Press Media Editors and the White House Correspondents Association — that Acosta's press pass be reinstated.